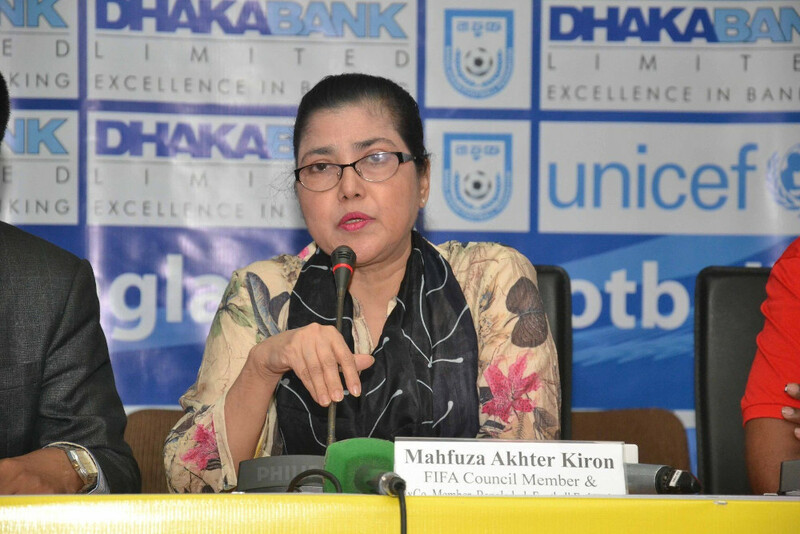 FIFA Council member Mahfuza Akter Kiron answers questions during a news conference in Dhaka, in this undated photo. A Dhaka court granted bail Tuesday to a council member of football world governing body FIFA, a lawyer said, days after Bangladeshi authorities arrested her over televised remarks perceived as defaming Prime Minister Sheikh Hasina over the leader’s alleged sports bias. Police arrested Mahfuza Akhter Kiron, a Bangladeshi national and head of women’s football at the Bangladesh Football Federation, at her residence in Dhaka on Saturday, four days after a court issued an arrest warrant. It followed a defamation complaint in which Kiron allegedly criticized the PM for favoring cricket over football. “The court was very kind to grant her bail till April 2, the next hearing date,” Kiron’s lawyer, Liakat Hossain, told BenarNews. She was not released on Tuesday because the court order did not reach jail authorities within office hours, he underscored. “Hopefully, she will be released tomorrow,” he said. The Zurich-based FIFA, or the Federation Internationale de Football Association, did not immediately respond to a BenarNews email seeking comment. Hossain said the court granted bail after he filed documents claiming that Kiron was suffering from health problems. Kiron’s arrest was prompted by a defamation complaint filed against her on March 12 by sports organizer Abul Hasan Chowdhury, who accused Kiron of issuing “objectionable words” about Hasina during a television show on March 9. “Her comments were aired in TV channels and printed in newspapers. So, my client filed a defamation suit under section 500 of the Bangladesh Penal Code,” Karim told BenarNews on Tuesday, referring to Kiron. In 2015, Kiron served as a member of the organizing committee for FIFA Women’s World Cup Canada. She is also a member of the Asia Football Council’s executive committee. Following the enactment of the draconian Digital Security Act (DSA) last year, there has been a chilling effect felt across the society and the Bangladeshi media, AI said. On Aug. 6 last year, police arrested prominent photojournalist Shahidul Alam and kept him in prison for 107 days, accusing him of spreading “false and fabricated” content online about student-led protests over road safety that rocked the country that month. Under the vaguely worded DSA, anyone can be imprisoned for up to 10 years and face heavy fines for sharing their legitimate views online. The punishment for a repeat offense can be life imprisonment, AI said. More than 50 people have been arrested under DSA during the past five months for online comments critical of Hasina and members of her family, AI said. Hasina won her third straight term in December and had consistently rejected allegations that press freedom was under attack in the Muslim-majority nation of more than 163 million people.